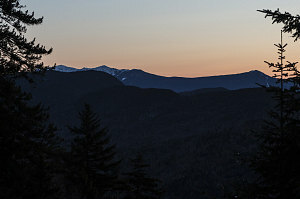 After spending a very nice early spring day in the Adirondacks climbing two smaller peaks - Catamount and Snow - it was time to cap off our 2013 Easter Weekend mountain outing with something more substantial. Jenn had been slowly working her way to the completion of her Northeast 111er list, and we thought it might be a good time to check another peak off of that list. 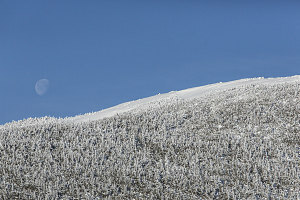 In the mood for something scenic, we chose a peak with a bald summit - Mount Moosilauke in New Hampshire. 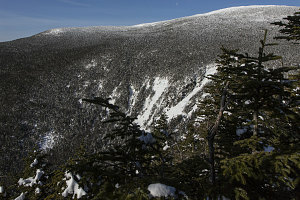 Mount Moosilauke is an outlier of the White Mountains of New Hampshire. 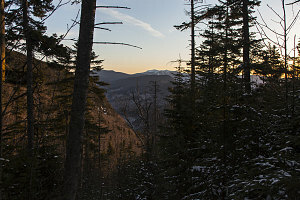 Although it is a fairly high peak (reaching almost to 5,000 feet), it is geographically isolated somewhat to the west of the main mass of the White Mountains. It is a very broad-shouldered peak with a large, flattish summit, and (one of the reasons we came to climb it) it has a nice large area of above-treeline tundra on its summit. 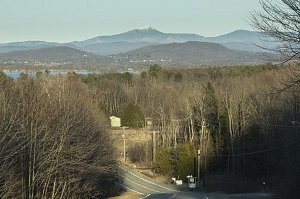 So, from our position in the south-eastern Adirondacks, we drove eastward through the pretty farming country surrounding Lake Champlain, crossing into Vermont with the snow-capped Green Mountains (and Camel's Hump, in particular) in front of us. 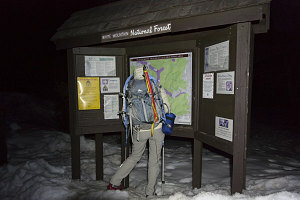 Many ups and downs and twists and turns later, we arrived at Kinsman Notch, along New Hampshire's Route 112, around 9:30pm. 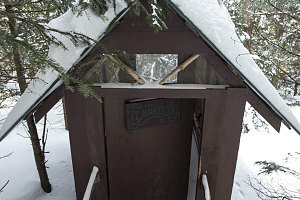 Here we made the seats flat in the CR-V and settled down for a short six-hour sleep in a corner of a parking lot of an off-season picnic area. We arose shortly before 5am to get a nice early start on our climb. The plan was to finish the hike early, for we had to drive several hours back to Ottawa, and there was an approaching change in weather that was slated to change the skies from clear to cloudy by noon. I very much wanted to experience Moosilauke's beautiful summit in the clear. We were ready and off at about 5:30 a.m., still fully in the dark. 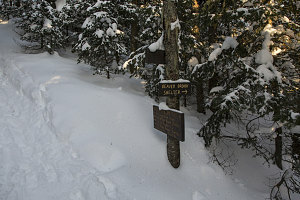 The route we had chosen from Kinsman Notch followed a section of the Appalachian Trail known as the Beaver Brook Trail. 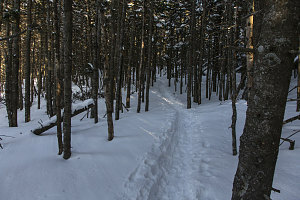 The trail ascends the eastern flanks of Moosilauke in a very direct and steep manner - after a brief flat stretch in the notch, the trail snaps almost immediately into ascent mode, climbing approximately 2000 feet in less than 1 mile. That's an average grade of nearly 40% - very steep, even by typical north-eastern trail standards. Up, up, up, we toiled, stopping regularly every 250 of elevation gained for a quick break. 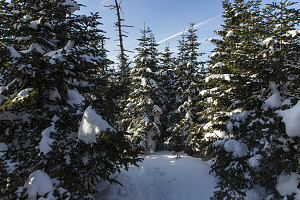 The grade was indeed relentless, but the trail conditions were remarkably good. 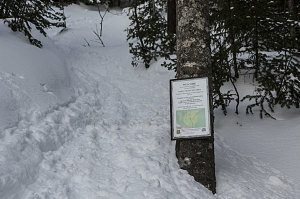 It was well below freezing, and there was a very deep snowpack. 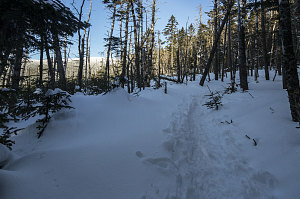 That, combined with a good solid boot track, meant we had excellent footing with next to no ice or other obstacles - traits for which the Beaver Brook trail is often known. 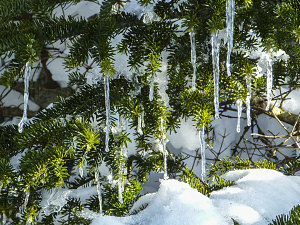 The footwear equipment of choice in these conditions was a pair of microspikes, which did not hinder foot placement much but provided just enough grip on the firm pack of the trail. 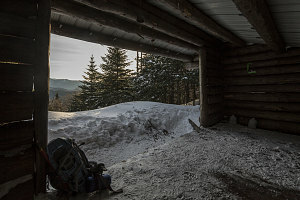 Despite the steep grade, we made fairly quick progress, arriving at the Beaver Brook Shelter at the 3750-foot mark by 7 am. 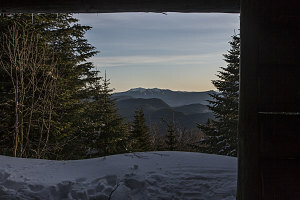 We had a slightly longer snack break here, taking in the very pretty view over to Franconia Ridge that you get from the shelter. A very clear and calm day had dawned by this point. Properly re-fueled and re-hydrated, we returned to the Beaver Brook trail and continued our ascent. 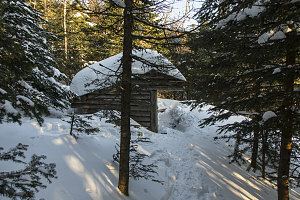 Above the turnoff to the shelter, the grade of the trail begins to lessen noticeably, and in less than 250 feet of vertical, flattens out completely. 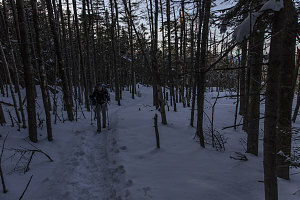 We had arrived on the eastern shoulder of Mt Moosilauke - a fairly large flat, forested arm with a few minor bumps that extends for some distance east of the main summit. 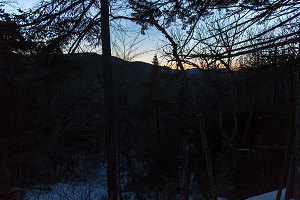 One benefit of the super-steep Beaver Brook trail was that we were now at over 4,000 feet - more than 2/3rds of the vertical way to the summit - even though we had only been hiking less than two hours. The rest of the way involved a far gentler grade, and likely a very decent hiking pace. 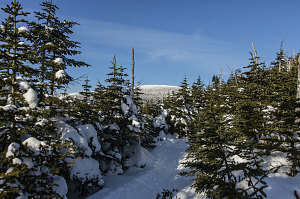 With an excellent hard-packed trail to follow, we turned north, following the Appalachian Trail through fir trees towards Mount Blue, a forested 4500-foot subsummit of Mount Moosilauke. 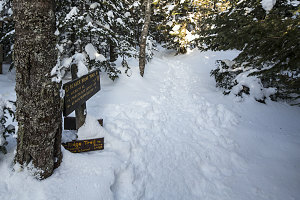 The trail ascended towards but did not climb over the Mt Blue's summit, instead turning and traversing across its southern slopes. 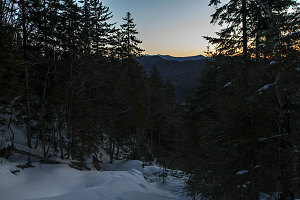 The large snowpack meant we were walking nearly a full person's height higher than in summer, and the extra height was enough to provide many views of the surrounding landscape. 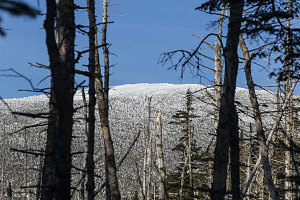 Dominating all was a brilliant sliver of white on the western horizon - the gently-rounded summit of Mount Moosilauke - covered thickly with very clean, white snow.